Decorating t-shirts is so much fun for kids. They get to personalize their own shirt and proudly wear it all summer long! These red, white, and blue patriotic t shirts are a perfect activity to add to your Memorial Day or 4th of July Festivities. They are an easy activity for kids of all ages, and they will love it! To prep the t-shirts, place a piece of cardboard inside the shirt and pull it tight and secure in the back. This gives the kids a nice, flat surface to paint on that won’t shift as they work. 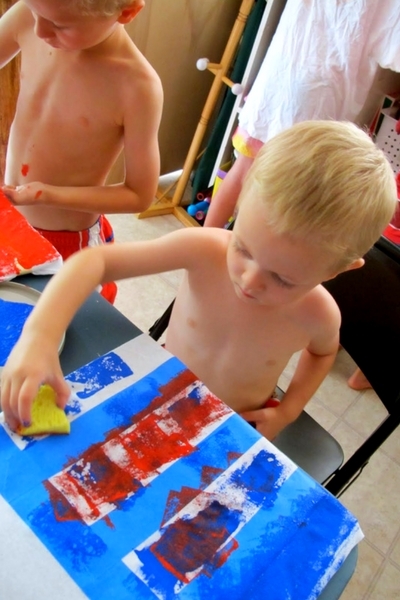 Use masking tape to create stripes on the shirts. 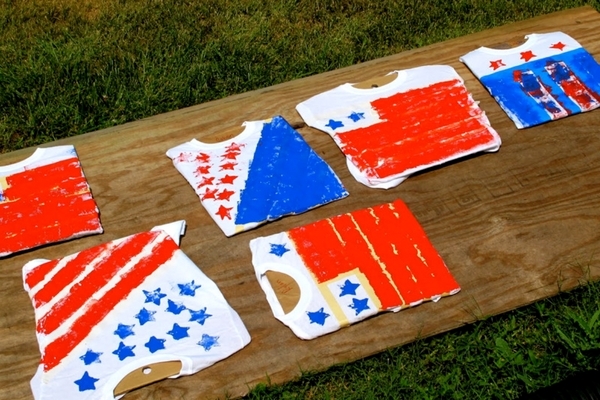 Let the kids design how they wish- their shirts can end up looking like real flags or their own interpretation of the stars and stripes. Pour out some red and blue acrylic paints on the trays. Acyrlic will not come off once it’s dry, so make sure you use something you don’t mind getting stained. I like to use lids from food cartons or Styrofoam meat trays for painting. Set out some sponges for painting. Cut a few into the shape of a star for stamping stars. Using the sponges let the kids paint their shirts. They should use a stamping or dabbing motion, not brushing or rubbing. They can decorate their shirts with red stripes, blue stars or any combination they like. Once the shirts are completely decorated, lay them out in the sun to dry completely. This is a great time do to all the other fun holiday activities you have planned! 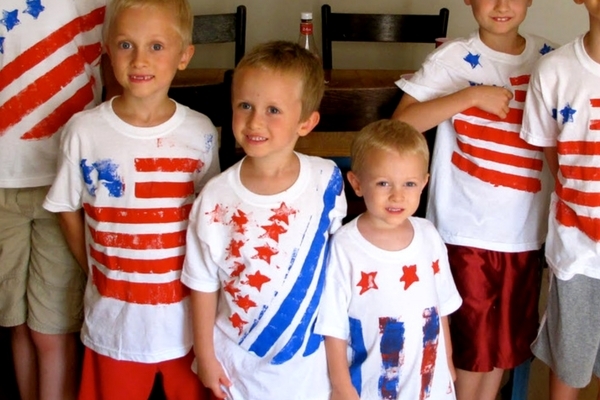 When dry acrylic paint will not come out of clothing, so these patriotic shirts won’t bleed or fade after washing. Washing a few times will reduce the stiffness of the paint. Now all that’s left is to proudly wear your red, white and blue decorated shirts to celebrate our country and our troops!